Planning of the bedrooms should begin with an awareness of their specific purpose. Contemporary bedrooms have combined to create a sense of harmony, freshness and comfort. There is no need to spend a fortune to realize the bedroom of your dreams - it takes good ideas and proper planning in order to stay within the budget. Because of its importance, sleeping require special attention in terms of design and decoration. Before this is all set for relaxation, romance and shared dreams. One of the highlights of contemporary bedrooms in a bed, which is primarily delivered by the bedspread and decorative pillows on it. These elements may be supplemented or replaced on a periodic, which is an easy way to renew and update the look of the old bedrooms. A great solution for the floor of the modern bedroom is huge carpet of natural wool, covering the entire floor and delivering deliciously feeling legs and entire body. The price of luxury in this case is difficult to clean the bedroom and the need for periodic reversal of the furniture in it for cleaning the carpet at least once a year. Trim in the bedroom should not have much and are carefully chosen - a clock, picture books and several reading lamps would have been enough. The spacious bedrooms may provide additional folding bed, which allows to accommodate more guests if needed. Modern bedrooms must recreate a relaxing, cozy and romantic atmosphere. 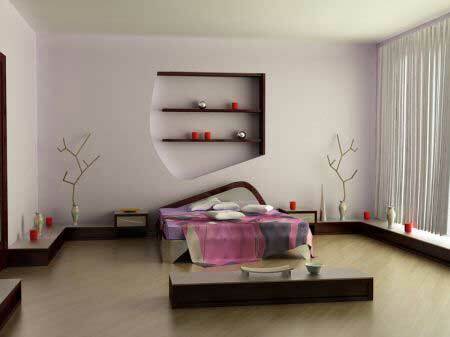 The main colors are crucial to the mood of the bedrooms. To achieve the feeling of more space, in addition to bright colors can be added and a large mirror. If your bedroom has long finished already tired you, an easy way to shift a fresh variety of furniture. In most bedrooms have a few walls, against which may be placed bed. The painting is the most efficient among the fastest and cheapest way for the resumption of the bedrooms. Curtains or blinds in the bedrooms are crucial for ensuring good dim and quiet sleep during the day and prevent undesired awakening early in the penetration of daylight into the bedroom early this morning. Quantitative composition and humidity in bedrooms are not irrelevant to sleep. Typical drying air during the winter heating season is a serious irritant against which there is no simple solution. Ordered bedrooms and lack of clothes and objects cast on the other hand also act calming and conducive to the light and restful sleep. It is desirable that the lighting in the bedroom should be governed by a dimer can be set for a partially overshadowed optical comfort. Dark bedrooms require more light, ie as potent or more number of luminaries as dark furniture and walls absorb light. Another easily accessible convenience of modern bedroom is for mounting one or two key lights near the bed.